Capp ApS is a privately-owned Danish manufacturing company, renowned for being the exclusive manufacturer of the CappAero 384 Pipettes which are available in 16-, 48- and 64- channel models. 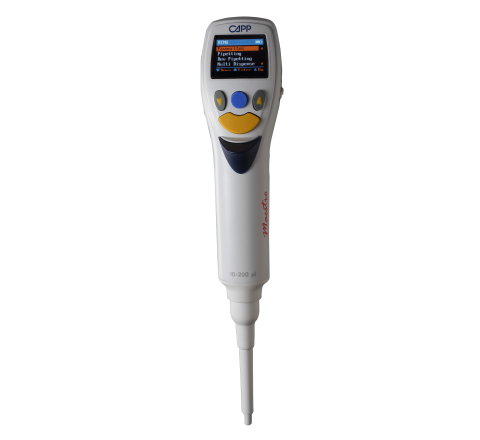 The Capp 384 64-channel pipette is the only one of its kind on the market. Capp Multichannel pipettes increase productivity in your lab and can substantially reduce the amount of time you spend on your experiment. 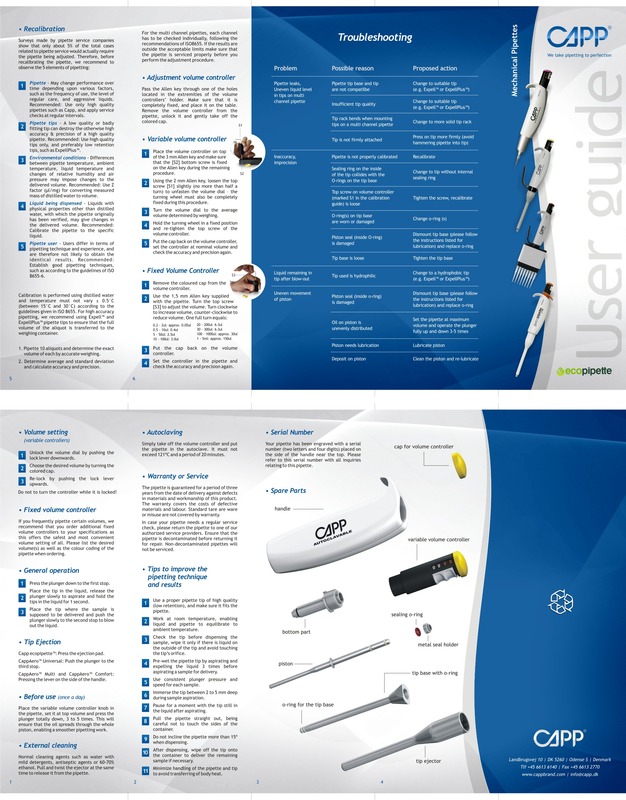 Capp Pipettes offer a comprehensive selection of quality pipettes designed to fit your needs. They are uniquely designed and made of high-quality material to ensure their longevity. Capp Pipettes include Capp Bravo, Capp Tempo Pipette Controller, CappRhythm Repeating Pipette, CappAero Fixed Volume Pipettes, CappTronic Electronic Pipettes, Capp R10 Repeater, and Capp Aero. With an overexaggerated curved finger hook to make holding the pipettes a breeze, Capp is redesigning the shape of pipettes with both aesthetics and ergonomics in mind. Fully autoclavable and offering a wide volume range, Capp pipettes are ideal for working in PCR, qPCR, microarray, spectrometry, and more. Capp multichannel pipettes are equipped with an innovative tip ejector lever. Rather than having to press hard with your thumb on a typical pipette tip ejector, the multichannel pipettes from Capp feature a fully adjustable, prominent lever which is operated with your other fingers and can rotate 360° around the pipette shaft. This flexibility allows the operator to adjust the lever to whatever position they feel comfortable. The CappAero 384-well line of pipettes also includes a 16-channel, 48-channel and 64-channel pipette which is ideal for PCR, qPCR, microarray, and MALDI spectrometry work. The CappAero 64-channel pipette is the fastest, easiest, and most affordable way to complete a 384-well plate. 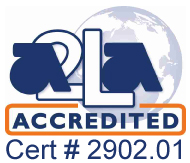 It allows you to complete a large sample within a short period of time, drastically reducing your workload. 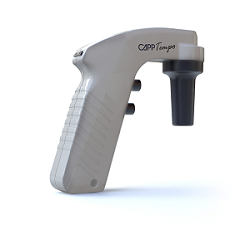 Only Capp Aero pipettes have removable volume control knobs to avoid downtime for calibration. Both Capp Aero single and multichannel pipettes are equipped with double o-ring seal on the shaft for easy mounting and ejection of the pipette tips. Capp Pipettes are engineered to be comfortable and precise. The versatility and durability of Capp Pipettes ensure efficiency and satisfaction. 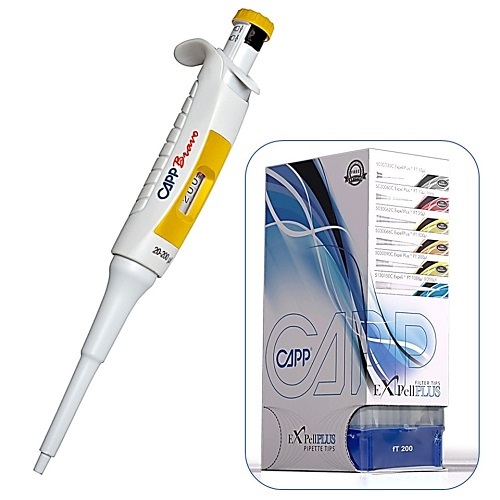 CAPP Bravo Pipette Bundle Deals - CAPP Bravo Pipette & CAPP Expellplus Pipette Tips. Capp 384 Pipette is designed for all 384 well liquid handling work and is available in 16-, 48-, and 64- channels. The Capp Motorized Pipette Controller is light in weight and ergonomically designed to keep you free from fatigue during use. The Capp Motorized Pipette Controller weighs only 167 g, including the battery unit. The lithium battery of the Capp Motorized Pipette Controller has no memory effect and enables up to 12 hours of continuous use between charges. The CappRhythm Repeating Pipette has a stepper pipette design. It is the ideal basic repeating pipettor, offering 45 dispensing volume options and covering a dispensing volume range from 1 µL to 5 mL, with a total volume capacity of up to 50 mL. The CappRhythm Repeating Pipette offers wide compatibilities and compatibility with other brands of repeating pipettor tips. A selection of CappTronic single channel pipettes covering the micro range from 2µl up to 1000µl, and the multi channels from 2µl up to 200µl.